From the bestselling author of The Country Practice comes a quirky and insightful story about fighting for what you believe in, and finding love where you least expect it. Leah Jackson leaves behind everything familiar, taking up a job as the resident safety supervisor and nurse in a construction fly camp in the remote South Australian outback. 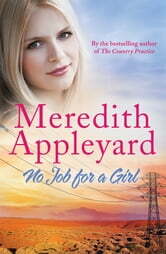 Everyone has told her that it's no job for a girl, but this isn't the first time she's had to prove her mettle. Project adviser Alex McKinley is happy to be as far away from the city as he can get. Recently divorced, he's reassessing where he went wrong. Alex has nothing against women specifically. He'd just rather they weren't working on his construction site, sharing his office, invading his space. In the close confines of the desert camp, anything can happen, and Leah soon finds herself the centre of attention - from bothersome bureaucrats to injured workers and hordes of isolated men. But it is one man in particular who pushes her to her limits ... in more ways than one.